Since its inception in 1975, Phoenix Geophysics has been a pioneer in the application of electrical methods for petroleum, geothermal, mining and ground water exploration and monitoring. Phoenix's patented Satellite Synchronized technology for geophysical applications has been widely used throughout the world, particularly in China, Japan and Russia and has become the industry's de facto standard for quality. Among the products particularly well known are the System 2000 Satellite synchronized MT (SSMT), the V5-16 Multifunction System and the High Power Spectral Induced Polarization System (SSIP). During the two years 1981–1983, Phoenix executed a large-scale hydrocarbon Spectral Induced Polarization (SIP) research program, sponsored by twelve major oil companies. In this program, Phoenix successfully developed the first 100Kw SIP transmitter and data acquisition system, and concluded that the SIP method is a viable specialized tool for hydrocarbon exploration. Throughout the years, with the accumulation of field application cases and the advance in data acquisition and interpretation, the technique has become economical and attractive for detecting potential oil and gas traps. Phoenix's customers in China are using it with remarkable success to complement seismic techniques in locating sweet spots for drilling. Spectral Induced Polarization (SIP, also called Complex Resistivity or CR), is an electrical method which can be used to map variations in the electrical properties of the earth which are related to geochemical alteration phenomena associated with hydrocarbons. When an electric field is applied to the rock, electric current flows through the earth and charge separation takes place at certain mineral-fluid interfaces as depicted below. In other words, the interface becomes electrically polarized. This is the origin of the term Induced Polarization (IP). The IP response also refers to the capability of the earth material to store electrical energy in a manner analogous to a capacitor in parallel with a resistor, as shown in this simplified model : If an alternating current is applied, the IP effect appears as a phase lag between the transmitted current and the measured voltage. The resistivity of the rock can be determined from the transmitted current, measured voltage and the measuring location relative to the transmitter. The phase lag varies with frequency and volume percent of the polarizable materials. 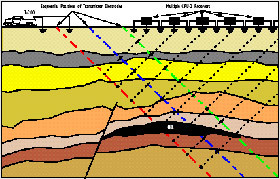 The resistivity of the rock in most oil fields is determined mainly by its porosity and the resistivity of the fluid. An increase in the ion content of the fluid leads to a decrease in resistivity. Positive IP anomalies above oil deposits have long been observed in Russia. Detailed studies carried out in China since 1990 have also shown IP response is stronger at and around oil reservoirs as well as along the hydrocarbon migration path. The latest, most advanced SSIP System, manufactured by Phoenix Geophysics for oil and gas prospecting, is the satellite-synchronized SSIP-2000 System. It consists of a 160Kw T-200 high power geophysical current source (or 100Kw model T-120) that transmits the current waveform into the ground and an array of CRU-2, 2-channel data acquisition units that receive the earth's electrical response. The transmitter and receivers are synchronized by GPS Satellite signal. They are normally set up in a dipole-dipole array with separation from 100 to 8000m. The satellite synchronization technology eliminates the need for a cable link between the transmitter and receivers. Elimination of cable links means more productive field operations and higher quality data because of minimized pickup of EM coupling between transmitter and receivers. Many observations of the IP effect have been made over oil and gas fields. IP sounding and profiling have been used extensively in Russia to find evidence of hydrocarbons over potential oil deposits. Examples include IP profiling in the North Caspian depression (the Kenkiak oil field) and Tataria and Saratov regions (the Russian Platform). Results of IP profiling in the North Caspian depression (after A. Kulikov.) 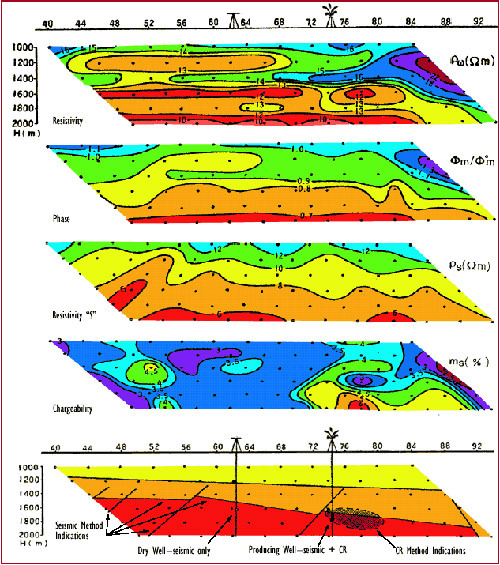 Pronounced maxima of apparent polarizability and the Kulikov phase parameter appear directly over the oil deposits. Schematic map of IP anomalies characterized by large values of chargeability. The IP anomalies correspond closely to the oil deposit contours. 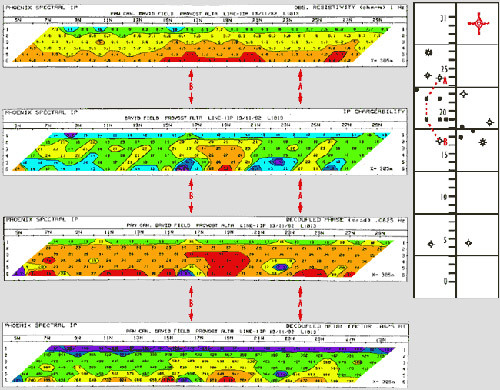 Since 1990, users of the Phoenix High Power SSIP system in China have undertaken commercial Complex Resistivity surveys to detect the presence of oil and gas in the structures delineated by seismic surveys. Published statistics show that between 1993 and 1998, CR surveys have been performed at over 103 structures in eastern central China, and 31 holes have been drilled. The results of 23 holes (74%) conform to the data from the CR surveys. Examples include the Cement, Chickasha, Velma, and Eola fields in Oklahoma, U.S.A., while David Field (shown below) was an early success in Alberta, Canada.